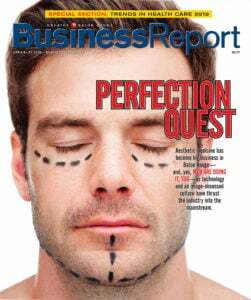 This story has been updated since its original publication to give proper credit to Mougeot Architecture for the rendering above. Louisiana’s wetlands are washing away at the frightening rate of 24 square miles a year, or, as it’s put, the equivalent of a football field every 38 minutes. A sports-related calculus helps to convey the situation’s urgency, but it doesn’t come close to communicating the real complexities of the coast in crisis. A new interpretative center aims to change that. 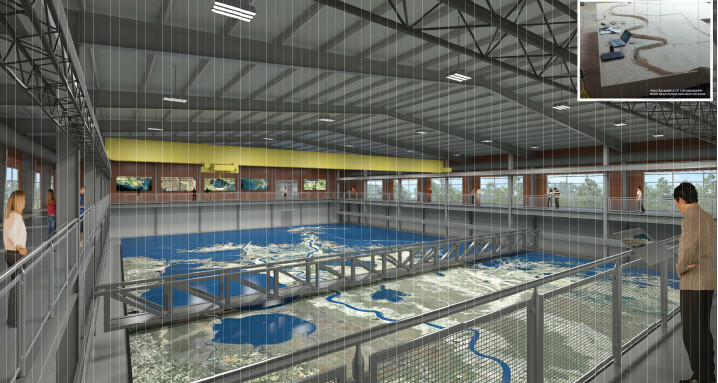 The 45,000-square-foot Center for River Studies, part of the forthcoming Water Campus on Nicholson Drive, will feature educational exhibits, learning kiosks and a 120-by-90-foot changing floor model of the lower Mississippi River system. Each component is meant to expand public understanding about why the Louisiana coast is slipping away and what is being done to stop it. The $17.9 million building is funded via the Coastal Impact Assistance Program, a federal program through the U.S. Department of Fish and Wildlife that funds projects from federal offshore lease revenues to oil-producing states. The project is being led by the Coastal Protection and Restoration Authority, a Water Campus partner. CPRA Executive Director Kyle Graham says that explaining coastal challenges visually has become an important strategy worldwide as low-lying communities grapple with water management. 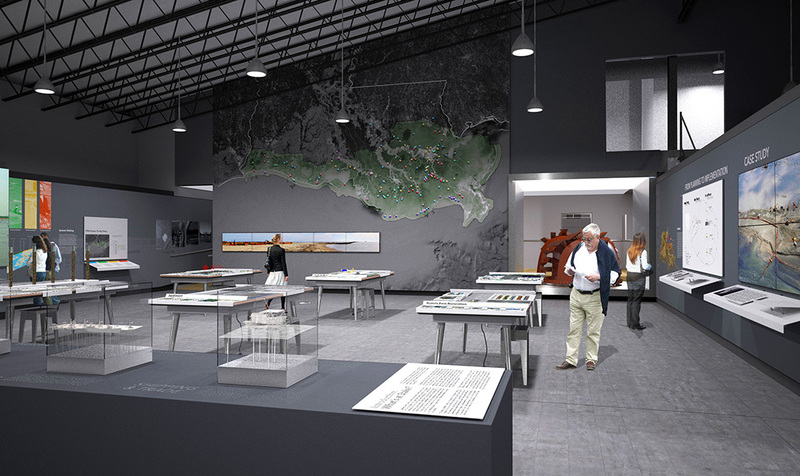 The exhibit space is being designed by the LSU Coastal Sustainability Studio, an interdisciplinary program among university scientists, engineers and designers that was established in 2009. The studio’s projects focus the ecology, settlement and economy of the Louisiana coast as it continues to change. CPRA awarded the CSS a three-year contract of $1.5 million to create interpretative visual materials that explain how the coast reached its state of distress and how science can be applied to arrest the problem. The exhibits in the center represent the first phase of that work and will total about $660,000. Students and researchers will be a key constituency, Graham says. The exhibits will present a “50,000-foot view” as well as more detailed information, he says. The Coastal Sustainability Studio is designing 9,000 square feet of exhibition space. A major component is the “Coastal 101” story, an exhibit that will span the interior walls. 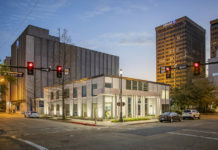 Visitors will enter the building and immediately take in large panels such as one entitled, “Shifting Foundation,” which shows cross sections of sediment from the Gulf of Mexico to Baton Rouge, and how they have changed. Another, called “Losing Ground,” shows the loss of wetlands over the course of the 20th Century on a large map and in photographs. Coastal 101 also features interpretative information about history of coastal erosion, which stems from two main sources: the Army Corps of Engineers diversion project, which changed the course of the Mississippi River after the flood of 1927, and later, the perforation of the coastline with channels for the purpose of oil exploration and transport. 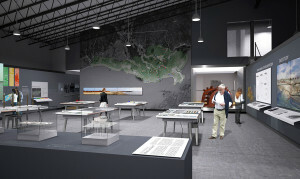 CPRA’s director of outreach and engagement, Jenny Kurz, says the exhibits will also show what is currently being done by Louisiana authorities to stabilize the river, and what might be done in the future to create sediment through possible new diversions, part of the Comprehensive Master Plan for a Sustainable Coast. Learning kiosks sprinkled throughout the floor of the facility are aimed primarily at high school and graduate level students interested in working on coastal issues. 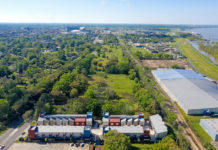 Indeed, the Water Campus itself represents South Louisiana’s push to become a global expert in coastal preservation research using the lower Mississippi River system as its laboratory. The wall and floor exhibits are meant to be thought-provoking and stirring, but they’re also a warm up to the center’s biggest draw: a massive floor model of the river, viewable at ground level and from surrounding catwalks. Graham says it will be one of the largest “moving bed” physical models in the country. It will depict 14,000 square miles of the coastal zone, from Donaldsonvillle to the Gulf of Mexico. The goal of the model is to demonstrate what the river looks like now, how it will change and what land-building will look like through sediment diversions that could take place. The model is constructed of 216 high-density foam panels that can be reshaped using a Computer Numerical Controlled, or CNC, router. The model is being fabricated by an outside vendor offsite. Graham says the Center for River Studies should open by the end of 2016.